If you have inventory at the Port of Savannah and require port drayage to your warehouse, you need the help of a company with a reputation for trust and experience. Here are some key reasons to choose Bonded Service Warehouse for your Savannah, GA port drayage needs. Port drayage can be complicated at times, depending on the products being received and moved. It’s best to use someone with localized experience at the Port of Savannah. Our drivers are highly experienced with the specifics of Savannah port drayage; each has a minimum of ten years’ experience behind the wheel, and each has the appropriate credentials to have your products moved from port to warehouse. Additionally, Bonded Service has been in business for many decades, and we continue to dray at least 150 containers a month from this port. In short, we’ve done this a long time, and we know what we’re doing. Contracting drayage to a third-party service adds another link to to the chain, another place at which something can go wrong. At Bonded Service Warehouse, we don’t need to subcontract because we have our fleet of more than 20 trucks. This gives us direct oversight over your port drayage, and if something goes wrong, you know who to call. Once port drayage is completed, who handles your transportation? 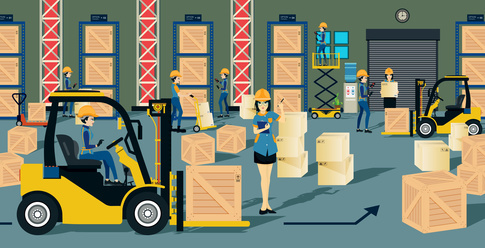 Who handles your warehousing? You could arrange for all these services separately, but this takes up considerable time and adds risk to the process. At Bonded Service, we provide a full array of integrated services from transportation and logistics to warehousing and inventory management. This means you can have your products drayed from the port, transported and stored without ever changing hands, making the process much simpler and more carefree. Your inventory is precious cargo, and you should only entrust it to experienced professionals who can handle Savannah, GA port drayage. To learn more about how we can serve your drayage needs, contact Bonded Service Warehouse today.